I liked the idea of blogging the Good, the Random and the Fun so much last time that I've decided to share a GRF post every now and again. Last week kicked off with Random when we walked past "Mimosa Cottage" (my name for the fixer-upper that I showed you recently, click here if you missed it) and discovered a new tenant in the garden. I haven't a clue where he came from as the house does appear to have been left abandoned but he's made himself at home very well and is so friendly. I love chatting with the horses that we meet on our daily walks. The SP and Fleur are used to me stopping for a chat and always walk on and leave me to it. When I called in at Super U (my local supermarche) for groceries on Wednesday I couldn't believe the amount of chocolate on display. I'm not a chocaholic so I wasn't tempted at all but there were plenty of other shoppers adding Easter treats to their baskets. Finally, the Good thing that happened last week was that Sean the Gardener came and dug up two of the vegetable beds in my potager leaving just one small bed for herbs, soft fruit and a few mixed salad leaves. Now all we have to do is wait for the grass to grow, creating a quiet place enclosed on two sides by the tall laurel hedge where I can while away sunny afternoons napping, reading and sipping tea. Chocolate...I do love it but I know that I can't leave it alone until its gone! I do believe it makes for wonderful gifts so I love a good chocolate shop. I hope someone is taking care of the horse in spite of the place being abandoned. I'm sure...the gorgeous creature looks quite happy! Good morning Maggie! The mosaic with mimosas and horses is lovely. I would like to have that hammock too! Have a sunny week! Oh what a sweet pony and I can tell he/she was enjoying your little chat Maggie! 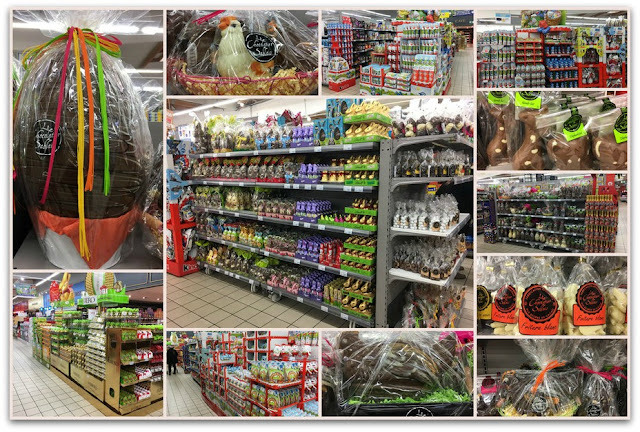 Our local supermarket is loaded with temping towers of chocolate eggs at every turn - I can't get away from them - much as I try!! Good idea with your garden - it gets harder every year and I find I'm adding more easy care shrubs like Camellias for winter and Roses for summer. I keep annuals in pots now. Many thanks for hosting and have a Happy Easter. The last few years I have found that chocolate tastes too sweet, so I've been adapting to the darker kind, which has been a pretty smooth transition, since Greece has some delicious brands. Your potager (I love that word!) sounds like it will be THE spot in which to hibernate, despite it being summer. Thanks for hosting. Wishing you a lovely week of sunshine and warm smiles! Just looking at all that chocolate would give me a sugar high. I love horses and I'd join you in talking to each and every one. I like the changes to your garden -- less weeding, but more mowing -- maybe your horse friend would be willing to help with the mowing! 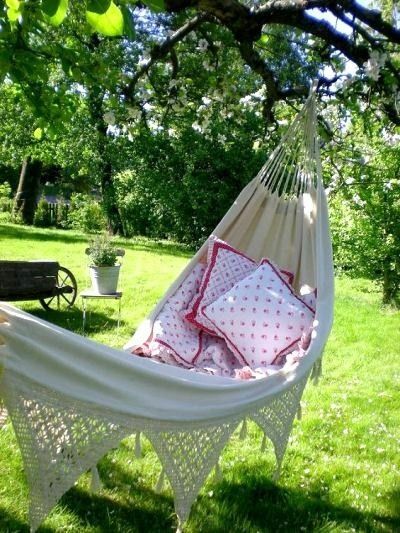 Love the hammock! Go for it! Have a wonderful week and thank you for hosting. I loved that episode - they just keep getting better! I do love chocolate, but have resisted the temptation to buy any Easter candy yet - I will have to fill some eggs for our annual Easter egg hunt - fingers crossed I don't eat too much of that. Have a good week. I might try to join in this time, I've not done so yet. I will go make a mosiac photo. Thanks. Good morning from the Pacific Northwest. I do like that laurel hedge. Hmm...I wouldn't mind a hedge or two for privacy. Glad you got someone out to dig for you. How fun to see the friendly horse on your walk. I like that name...Mimosa Cottage. Hope you have a lovely week Maggie! I like the name 'Mimosa Cottage" and I hope someone comes along to revive it, Maggie! Good for you to make yourgarden beds smaller and less work! Enjoy more leisure time this summer. Maggie, you are like me. I stop and talk to the animals too, especially little critters in my garden. It's interesting how some will stare and listen, not the least bit frightened. I talked to a hawk up in the branches of our oak for about five minutes on afternoon, telling him/she how happy we were that that were raising their little family in one of our trees. I truly think the bird understood. Now that we have Sadie, I'm thankful that they moved on to other real estate. I worry about hawks, owls, coyotes roaming in out wooded area and the threat they could cause to Sadie. That is an awful lot of chocolate. I'm not tempted by the displays either. I'm all for relaxing in the sun now instead of slogging away in the veg patch. I've reduced mine down to large containers on plant tables, and it sure is easier to manage. Have a great week. Oh Maggie, what a fun mosaic! I love your candy store photos and the garden will be lovely. It looks like spring has come to your world. I'm still waiting! I've got a horse in my post too! Love your GRF idea! The changes to your garden will give you a lovely space, hope you can find a hammock like that to swing in! They are very good for relaxing in as you cannot do a thing other than just lay there! Just dropping by to see what you're up to, as I wasn't able to get anything ready on time for an early week post. Your outdoor space (almost a room) is going to be wonderful! And it leaves just enough garden. Enjoyed the random and the fun ... and (as they say these days) it's all good! See you next week with a link. Another delightful post, Maggie. Your idea for your garden spot sounds like just the ticket for relaxation. 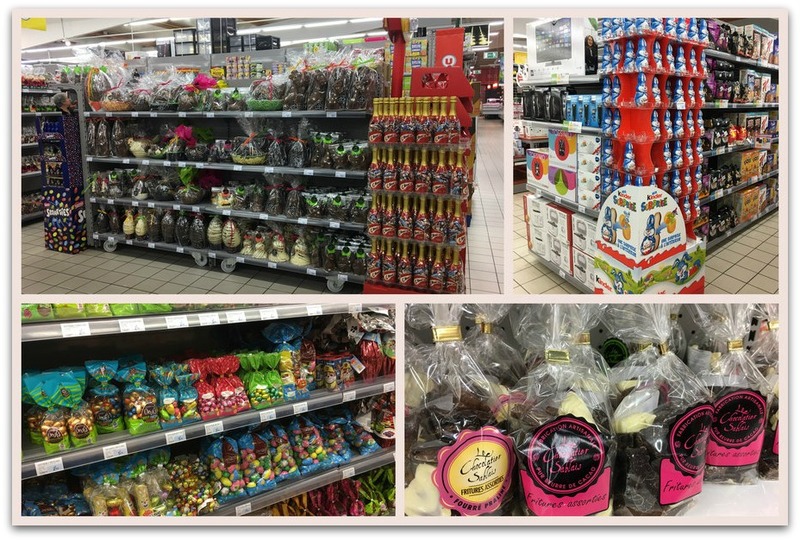 That's a lot of chocolate in the supermarché! I do like chocolate, but prefer the dark (and more expensive kind) than what's in all the seasonal stuff. Tant pis! I didn't get organized enough to join MM this week - hoping for next. Have a good rest of the week.